As spring rises from it’s slumber, we see beauty unwrapping itself before our eyes. The exquisite beauty of a tulip or iris in springtime brings forth in ourselves the feeling of being unencumbered which winter can laden us with. The budding of a tree reveals life in it’s freshness – the beginnings of a new cycle. I love the simplicity which artist’s can capture in their works. Simple works need not be filled with much movement and surplus material. The idea of displaying the beauty found in an entranceway may be somewhat odd but this artist has chosen such a spectacular entrance that there is much beauty to be found. Unsigned and untitled – I know not where this doorway is to be found – but I know that if I were to pass – I would stop and admire. A door within a door plus a door! Living near the town of Cambridge I have imagined this door to be an entrance to one of the colleges. For a door within a door means a courtyard within. A courtyard within means an inn or college grounds or even a church close. And a door for the pet of the college or close shows a care offered to all the inhabitants both human and animal. 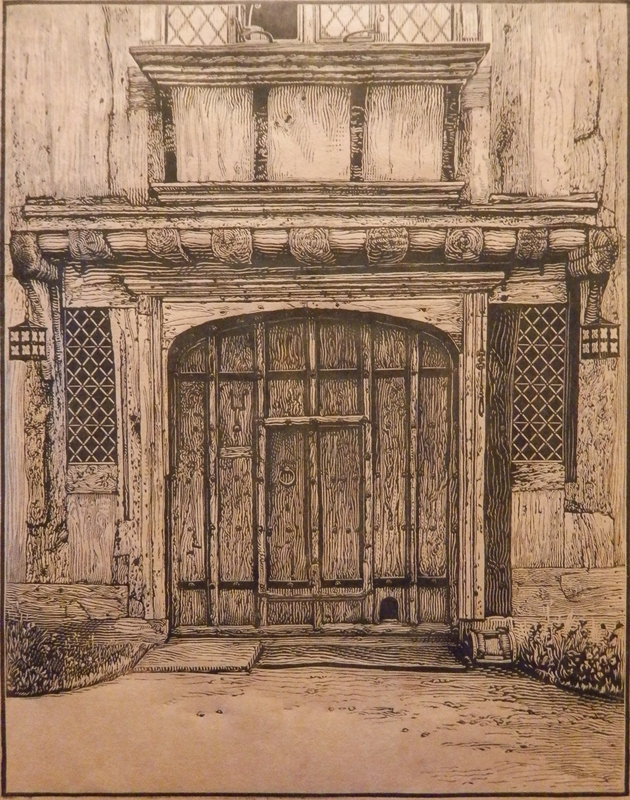 A superbly detailed engraving showing the grain and whorls found within the wood which makes up the door and structure of the residence. The flowers grow in their beds, the leaded glass windows reveal what is without, the boot scraper at the bottom of the right door post , the bell pull to the right of the main door – all show a place well cared for – maybe even a place of some import. signed AEP – Amy E P? 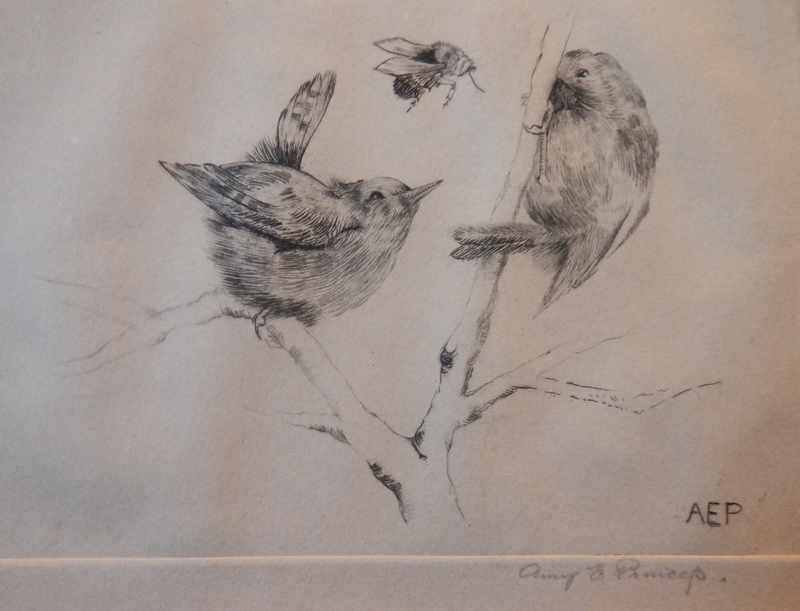 The beauty of this etching comes from it’s simplicity of line. It has a simpleness and clarity that gives voice to its’ beauty. Not business but a descriptiveness of a single moment dissolved into its’ main characters is what gives this etching its’ beauty. I think this etching even more beautiful now than when it was printed – as the paper has aged and coloured – enduing it with warmth of feeling and depth of presence. I wish I could interpret Amy’s last name so that I might give her the credit that she truly deserves for such a wonderful work – maybe my readers might have a go at deciphering her name. If not please just enjoy two very fine artworks born of simple thought and described in the simplicity of beauty. This entry was posted in Etching, Lino/woodcuts and tagged balcony, bee, bell pull, birds, boot cleaner, branch, door, door in a door, doorway, entrance, lead windows, wood. Bookmark the permalink.